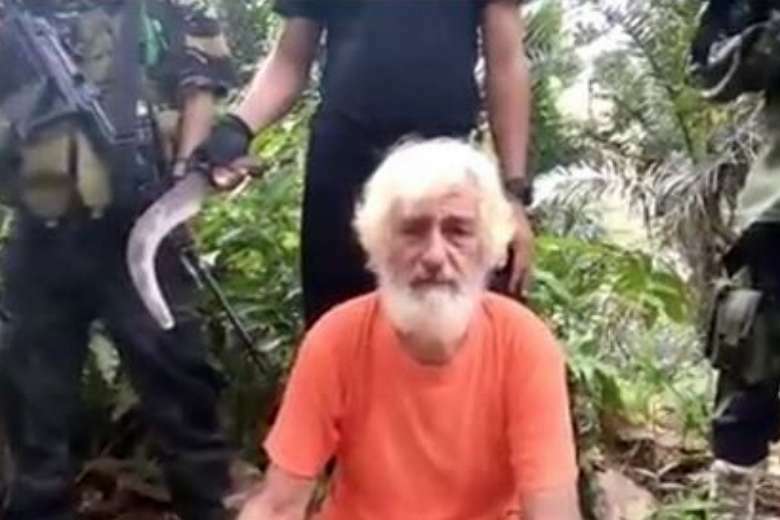 Islamist militants in the Philippines have reportedly beheaded a German man who, eight years ago, survived being held for nearly two months by Somali pirates. According to reports that security officials said they have yet to fully verify, Abu Sayyaf murdered Mr Jurgen Kantner, 70, after the collapse of talks for his release in exchange for a 30 million-peso (S$854,000) ransom. "Despite efforts exerted by groups and the security forces, I have received reports about the alleged beheading of a German kidnap victim in Sulu (on) Sunday afternoon," Mr Jesus Dureza, President Rodrigo Duterte's peace adviser and chief hostage negotiator, said in a statement he issued late on Sunday evening (Feb 26). A police report released earlier in the afternoon said Mr Kantner, a sailing enthusiast, was executed at around 3.30pm, on Sunday (Feb 26), in Buanza district, Indanan town, Sulu province, 1,500km south of the capital Manila. Mr Kantner was beheaded by men under a certain Muammar Askali, alias Abu Rami, purportedly a unit leader of the brutal Abu Sayyaf group, linked to the Islamic State in Iraq and Syria. Mr Dureza said Colonel Cirilito Sobejana, Joint Sulu Task Force commander, told him "validation efforts of such report is still ongoing". Major-General Carlito Galvez, commander of the Western Mindanao Command, and Colonel Edgard Arevalo, head of the military's public affairs office, said they also received unconfirmed information from the field that Mr Kantner was beheaded. Colonel Arevalo said security forces were still "on search-and rescue" mode, till they could determine what really happened to Mr Kantner. Brigadier-General Restituto Padilla, the military spokesman, said: "Until sufficient proof is obtained..., our assumption remains that the subject kidnapped victim is alive and well. Do not believe unvalidated information going around until proven otherwise." Mr Kantner was abducted while he and his wife, Ms Sabine Merz, were cruising a dangerous area of the Philippines, by the Abu Sayyaf, an insurgent group known for kidnapping and ransoming foreigners. Ms Merz was killed, purportedly when she tried to fight back with a shotgun. The couple have been sailing the oceans for many years aboard their 53-footer, the Rockall. They were held for 52 days in Somalia in 2008 before their captors freed them, reportedly after a six-figure ransom had been paid. The Abu Sayyaf has defied more than a decade of US-backed military offensives against it and gone a lucrative kidnapping spree in recent years.